iTero is a fantastic, state of the art dental technology that allows dentists and orthodontists to operate their practices with heightened efficiency. The iTero Element Intraoral Scanner is a dental scanning system that allows dentists to take scans of patients’ mouths with great accuracy and detail. The iTero system consists of a small wand that the dentist inserts into the patient’s mouth and moves slowly across the teeth in order to obtain the requisite image. The iTero system also includes a corresponding screen that displays the information collected by the iTero wand. The iTero screen provides real-time, 3D visualization of the imagery of the patient’s mouth as the dentist uses the wand. This fantastic feature provides patients with the ability to get an inside look at what is going on and makes it easier for the dentist to communicate and explain the situation to patients. The iTero Element scanning wand is sleek and agile, perfect for getting into the tiny spaces in a patient’s mouth. It truly is the best way to create a virtual model that will be used to create customized Invisalign aligners. The iTero wand is specially engineered to capture six thousand frames per second; it also boasts an image sensor that is able to execute a scan speed that is twenty times faster than most other models. As the dentist guides the wand through the patient’s mouth, the iTero Element simultaneously processes the scan. It automatically puts the images together and displays everything upon the corresponding screen. The iTero Element also saves all scan data to the system’s hard drive every two seconds, in order to ensure that no matter what, your work shall not be lost. After the dentist has completed the scan, the patient can see an accurate, 3D picture of their teeth upon the screen. The touch screen display is easy to navigate, and allows the options for zooming in so that the patient can be provided with a thorough look. Talk about a real visualization of a smile! 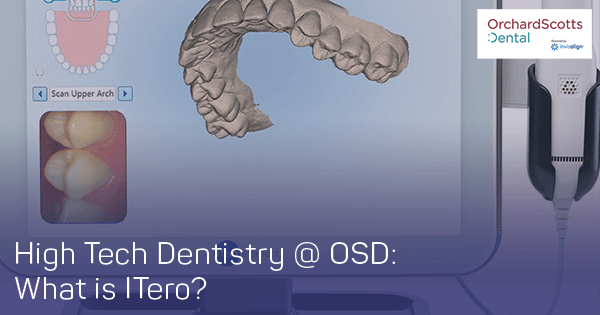 The Invisalign Outcome Simulator is an amazing feature that is offered by the iTero. It allows the dentist to show patients the scan of what their teeth look like at present, juxtaposed against an image of what their teeth will likely look like after their Invisalign treatment. Remember the days of stuffing trays of gunk into your teeth in order to allow your dentist to form a mold for your braces? Those days are long gone. OrthoCAD Cast allows dentists to create a digital mold that they can very simply export to manufacturers. The days of moulds and casts are long gone, thanks to this fantastic technology. Thanks to iTero technology, dentistry has become more efficient, and easier for the patient to understand, than ever before. Orchard Scotts Dental is proud to a dental clinic in Singapore that offers its patients the benefits of this fantastic new technology.